So you’re a moderator on a Discourse forum - congratulations! As a forum moderator, it’s your role to help oversee the forum, ensuring that users and content are in line with your TOS, FAQ, and other published rules/guidelines. Discourse comes with numerous tools to help you accomplish this. Let’s take a look at some common scenarios and see how each can be handled with Discourse. Part of keeping a community friendly and helping it grow involves being an example to others. When you notice a new user on the site (many times evidenced by a light-grey username instead of dark-grey, which shows that a user is Trust Level 0), say hi and welcome them to the site. Even if you have nothing else to say, that initial interaction is important for new members to feel welcomed. Most users are good citizens on the forums, and will do their best to participate properly. Some users, however, will go above and beyond what is expected. It is to your advantage to recognize these users and encourage them to keep doing what they do. Active helpful users may reach TL3, which allows them to help edit titles and change topic categories. Users can also be manually promoted to TL4, which grants them global edit privileges on any topic or post they can see. Discourse maintains information on all users who register and interact with the site. You can get an overview of a user from their public profile. To access a profile click the user's avatar or username in a topic, their avatar in the topic list, or search for them. Above their profile is a count of official warnings, suspensions, flags received, and helpful flags given by the user. Just below are details on the user's account: when they last visited, posted, and registered. You can review all public activity by the user, as well as review the notifications they received. If you are also an Admin, you will have access to the user’s private messages as well. You can also view and modify the user’s preferences. This can be very helpful if a user is reporting an issue with their account that you suspect may be related to a preference change. 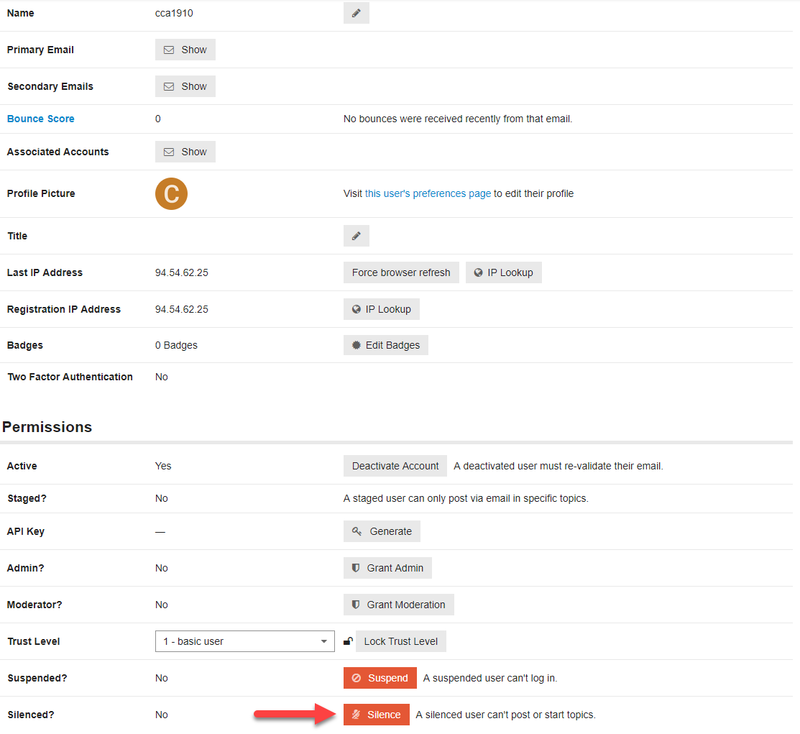 From a user's public profile you can access the user's Admin page. 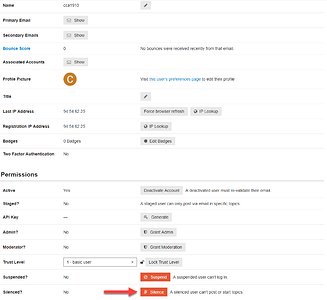 The Admin page can also be accessed from the hamburger menu, and then by clicking on Users. There you can search for users by username, email, or full name. Once opened, you can review additional details about the user, including non-public information like their registration and last-used IP address. IP information can be helpful if a user appears suspicious or acts too similar to another user. IP lookups are completed locally, no data is sent outside the server. As mentioned in “The Difficult User” section, this is also where users can be silenced/suspended, and their trust level adjusted. Public discussion on Discourse takes place inside of topics. Each topic has a title and category, and it is important that the discussion within relates to the title/category. If users provide a poor title or select the wrong category, you can edit the topic to update one or both. Scroll to the top of the topic and click the pencil next to the title. From there, the title and category can be modified. Topics, especially longer ones have a tendency to veer off-topic. When this happens, you can select posts to move to a new topic or an existing topic on the subject. This helps keep each topic organized and "on-topic". Sometimes users will start a new topic when one already exists. If the posts in the duplicate topic add to the discussion, they can be moved to the existing one. Moving all posts in a topic will automatically close the topic. If discussion in a topic is no longer productive or discussion is no longer focused on the topic, but instead on "attacking" other users instead of ideas, moderators should step in. Make a staff post. Many times, a simple reminder is enough to solve the issue. You can create a post reminding users to be polite, warn them they’re talking in circles, etc, and then use the post admin wrench to mark the post a staff post. This indicates to users that the post is the official position of the site. Set a topic timer. If the staff post doesn’t help, or discussion seems so heated that a reminder won’t help, you can “pause” the topic. 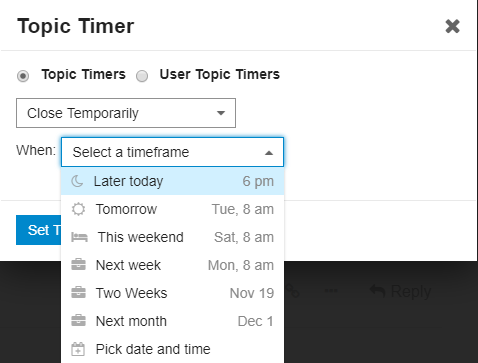 Use the topic admin wrench to set a topic timer for auto-open. 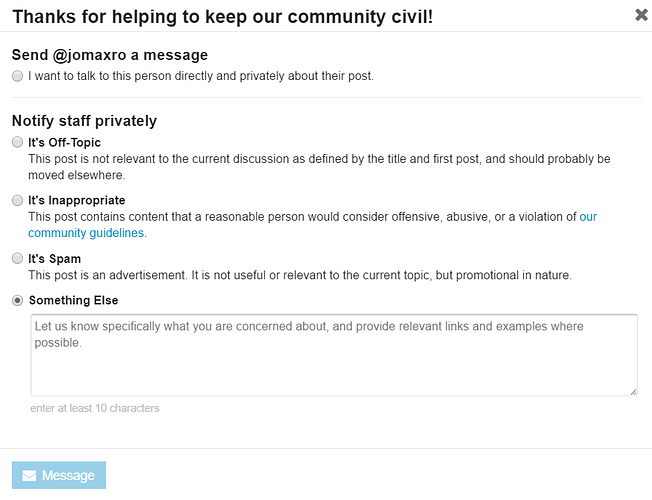 This will immediately close the topic, preventing new posts, and display a notice when the topic will reopen. On most sites, a moderator is not alone, but part of a larger team. This team includes other moderators, as well as site admins/owners, and in many cases TL3/TL4 users. Regular and open communication between all should be encouraged. The Lounge: The lounge is a default category on all Discourse installs restricted to users TL3 or above. The lounge is a great place for the moderator team to communicate with the site’s trusted users. These users should be encouraged to share their thoughts and concerns with the site staff within this category. The staff category: The staff category is a default category on all Discourse installs restricted to site staff: moderators and admins. The staff category is a great place for moderators to discuss what they’re seeing and doing within the site, as well as to document internal policies and procedures. Whispers: When enabled in site settings, moderators can take advantage of whispers. Whispers allow staff to create private replies within an existing topic or PM. This allows moderators to discuss issues within the topic, so no context is lost. Whispers can also be used to mention other staff if assistance is required, but a public reply would be inappropriate, and an invite wouldn’t provide the necessary context. Note: On most forums inappropriate content is rare. Discourse allows all users to help keep the forums clean, appropriate, and on-topic via the Flag system. When a topic or post is seen that does not belong, users and moderators can flag it for review. Flags can be your best friend or the entrance to a rabbit hole. When a user doesn’t like a post, they can choose to flag it for moderators. The flag dialog has 5 options: message user (does not cause a flag, simply opens up the PM dialog), off-topic, inappropriate, spam, and something else. Off-topic, inappropriate, and spam simply cast a flag, and the user is done. Something else allows for a custom message and then casts the flag. Once a flag is in the queue, moderators will see a red notification on the hamburger menu and can open the flag queue. From there, you can decide what to do about the flag. There will be 3 options: Agree, Disagree, and Ignore. Agreeing with the flag signals that you confirm the post is off-topic (or spam, or inappropriate, or …). You can then message the user to edit it (automated message, no option to customize), or delete the post. Disagreeing with the flag says that the post is not an issue, and there is nothing to do. Ignore means the flag doesn’t need further action. For example, a user might flag their own post if they need help with something. You would then ignore the flag so it doesn’t hurt their trust level. Agreeing will hurt their trust because their post was flagged, disagreeing may eventually hurt it because a moderator disagreed with their flag (disagree trust level impact is not developed yet). If you are ever uncertain about which option to choose, pick ignore and handle the post manually. Note that resolving a flag with a custom message will automatically generate a PM to the user who flagged the post. If you pressed “Ignore” or “Disagree”, they will get a reply with “Thanks for letting us know. We’re looking into it.”. If you “Agree” with a custom flag, the message will instead say “Thanks for letting us know. We agree there is an issue with the post and are looking into it.” There is also a third version of this message for when the post was deleted. Posts with 3 flags will be automatically hidden without waiting for moderator action. You might be wondering why flags can be the entrance to a rabbit hole. 99% of the time flags are easy to handle - the post is clearly spam, a user needs some help, etc. However, sometimes the issue can be harder to address. Maybe a user is continually swearing in their posts and abusing others after being warned. Maybe the request isn’t easy to solve. In those cases, don’t be afraid to reach out to your fellow moderators, or the forum owners for advice and support. Unless you are the only moderator, you shouldn’t ever feel like you have to make a decision on your own, that’s why you have a team. The auto-created staff category is a great place to have discussion with you team in private. At the same time, don’t hesitate to make your own decisions - you were made a moderator because you are trusted to do the right thing. Note: On most forums difficult users are rare. Most users will be respectful, post appropriate content, and not cause any issues. However, you may encounter a user that just doesn’t want to follow the rules, is rude, posts inappropriate material, etc. How can you handle them? Keep in mind, the below progression is a suggestion. There may be instances where one of the steps doesn’t make sense or the action was so egregious that a step (or steps) are skipped. First, try to avoid assuming that the user has a negative intent. They may simply be ignorant of the rules, may not speak your forums language well, may be young, or have another reason for the way they act. Try to contact the user privately via PM to let them know what is wrong with their behavior. Remember to talk about the negative behaviors - don't attack the user themselves. When possible, link to existing rules, guidelines, FAQs, or similar. When sending a PM to a user as a moderator, you can make the message an "official warning". This PM will automatically gain staff color, and a notice that the user has received an official warning will appear on the user profile for other moderators to see. In the official warning, be sure to explain the negative behavior you have seen, detail specifically what you’d like them to do instead, and the consequences of not changing their behavior. Silenced users are prevented from creating new topics, posts, flags, or PMs on the site. They are still able to complete other actions, like "liking" posts, reading topics, replying to PMs, etc. Additionally, they can communicate with moderators via PM, so you can continue to communicate with them to try and address the behavior. Navigate to the user’s profile, click Admin, then click Silence. Enter the silence duration, a reason, and a message. When silencing a user, explain to them what they need to do before they can be unsilenced. Suspended users are prevented from logging in, and thus from completing any actions on the forums. A suspension is the strongest possible recourse you have for a user and should be used sparingly. 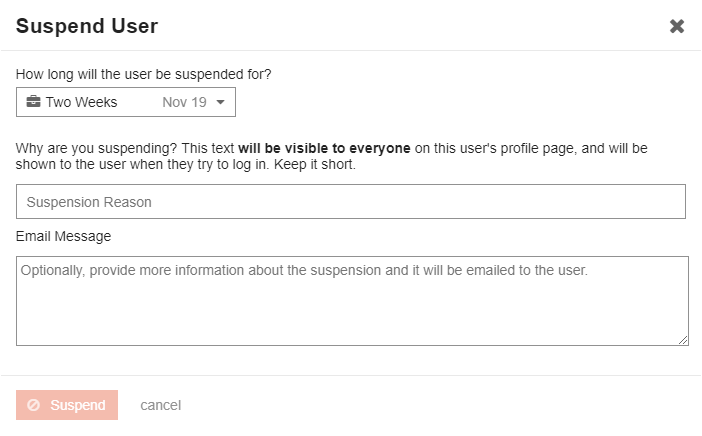 Like silencing, suspending a user is done from the user's Admin page. Like silencing, suspensions are for a specific period of time. You may want to suspend the user for a short period of time first, and if the user returns and continues the behavior, increase the suspension time. If a user posts too much, includes too many and/or inappropriate images, abuses the flag system, or similar an alternate to the above is locking the user to trust level 0. This will limit the number (and frequency) of topics and posts the user can create, as well as prevent them from including too many images/links and prevent the user from casting flags. 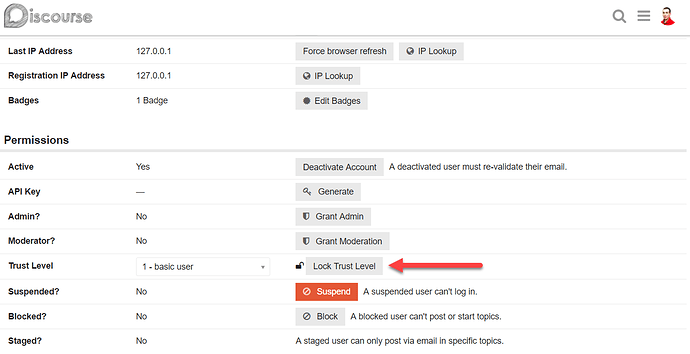 Trust levels can be configured from the user's Admin page. Documentation on how to moderate effectively? As a commenter, when does Flagged turn off? How does it work? Moderation Tips & Best Practices Guide? Help a new moderator understand Discourse? Understanding moderator actions and undo? Training videos for people new to administering Discourse? Approving or rejecting what? The flag or the post? Really well written how-to, thanks a lot. Just one little suggestion: did you put the section about the difficult user at the beginning for any particular reason? IMHO it is sending a wrong signal to moderators, like it conveys that dealing with difficult users is going to be their main job. I would move the “Difficult User” section to the end and perhaps move the one on the helpful user up. A more technical suggestion would be to add a table of content at the beginning to provide a quick overview of the rather long post. I strongly agree with that @jomaxro I would put all the negative stuff at the bottom, and all the positive - neutral stuff at the top. You might also mention that these scenarios are rare. Feel free to make the edits here as needed! Great post, @jomaxro - thanks for sharing this guide. It’s helpful to have documentation for new mods. Edit: The suggestions in this post have been completed. did you put the section about the difficult user at the beginning for any particular reason? Nope, just the order I happened to write it in. I had a bulleted list of stuff I wanted to cover, went in that order. I would put all the negative stuff at the bottom, and all the positive - neutral stuff at the bottom. You might also mention that these scenarios are rare. Assuming you want positive/neutral at the top (you said bottom twice ) - I’ll reorder it later this evening. Will also add note about the infrequency of these scenarios. Sure, I can add deep linking and a TOC. Guide was updated yesterday with new screenshots, some minor edits due to changes in Discourse, and a section on moderator communication (including whispers). cc @Benjol if you want to update your translation. Yes, that is still the case. We’ve take the first step towards this by displaying the user’s most common flag resolution status, but there is still no impact for a large number of disagreed flags. ok, and when it gets implemented, will it take effect on previously disagreed flags? I cannot answer that, we haven’t yet determined how it will be implemented. Hi Joshua, Is there a way as a moderator to view the forum as it would appear to new users with all pinned topics? Create a new test account that you can use to log in as a new user.